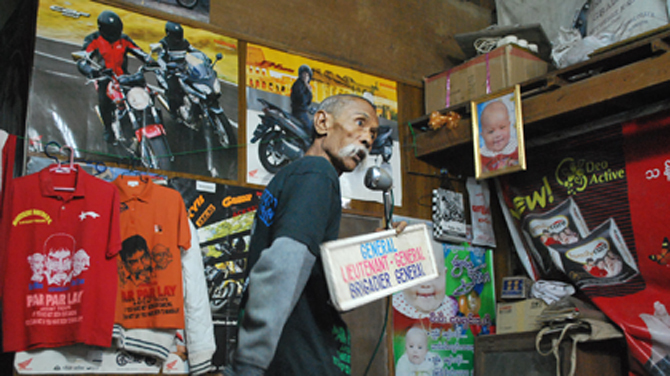 MANDALAY—A visit to The Moustache Brothers is a rite of passage for any foreign journalist visiting Mandalay, Burma's second city and the former capital before the invading British deposed the country's last King, Thibaw, in 1885. Lu Maw, the sole English speaker in the 60-something comedy trio, sits cross-legged on the floor in an upstairs room, chain-smoking cheroots and wise-cracking. A warm-up, it seems, for the Brothers' nightly performance, due to start in a couple of hours. Then the punchline: “But the Burma government makes sure there is no light 24/7, all year! They will solve global warming!” quips Lu Maw, referring to Burma's notorious electricity shortages despite the country having plenty of resources in the form of oil, gas and hydropower. The vaudeville trio are renowned in Burma for their send-ups of the country's military rulers, an irreverence that landed two of them, Par Par Lay and Lu Zaw, in jail after a performance at pro-democracy icon Aung San Suu Kyi's house in Rangoon in 1996. The interview, like the performance later that night, is full of veiled references and allusions to politics and society in Burma. Western countries and institutions do not escape, however, with Lu Maw hammering them over selective interventions in human rights-abusing countries around the world. The anyeint (Burmese for vaudeville) trio are not the sole attraction in and around Mandalay. What is deemed the world's longest teak bridge crosses a lake near Amarapura—the royal capital before the move to Mandalay in 1859. The 1,200-meter U Bein Bridge and Taungthaman Lake are a sight to behold at twilight, particularly in the brief period as the sun drops behind the horizon, leaving the water and sky to merge into an indistinguishable misty-grey behind the temples on the Mandalay city side, just before darkness envelops the scene. Mandalay Hill overlooks the city, 230 meters and 1,729 steps high, up a covered stairwell between benches carved with donation-funded inscriptions for merit-seeking families, on a site said to have been visited by Gautama Buddha. Dozens of Burmese amble up the steps, some stopping for snacks on the way, others sitting with the handful of fortune-tellers making less than a fortune from reading palms on the hill. Twenty-eight-year-old Kyaw Aung says, “I charge 1,000 kyat to read a palm.” This non-Buddhist practice at an otherwise Buddhist pilgrimage site serves as a reminder of the fondness of many Burmese for soothsayers and fortune-tellers. Thanaka-pasted women sell souvenirs, some handcrafted from locally felled timber. I count six foreign tourists in the three hours spent on and around the hill, admittedly on a hot Sunday afternoon, and the curious stares from vendors and local pilgrims suggest that Mandalay does not receive so many Western visitors, despite the city being glossed widely in songs and literature—a metonymy for “exotic” travel. That stems from Rudyard Kipling's “Mandalay”—although the British poet apparently never traveled as far as the old Burmese imperial capital. "Twenty-eight-year-old Kyaw Aung says, “I charge 1,000 kyat to read a palm.” This non-Buddhist practice at an otherwise Buddhist pilgrimage site serves as a reminder of the fondness of many Burmese for soothsayers and fortune-tellers." 1000 kyats for what? No production of good or service involved to improve people's lives. Only the rich should be employing thousands of palm readers to redistribute wealth and stimulate aggregate demand by empowering palm readers to spend. As much as I love 2 hate u,I have 2 say I love u more than hating u,regarding ur comments. Yes,All the ALIEN Journalist,also those local journalist that r still "WET" behind their "EARS" make us believe that they know ALL. They don't seem 2 realise that there r people in & out of Myanmar (formaly known as Burma still can't get it through their heads that the country has changed it's name) have a vast knowledge of local HISTORY & experience than they will ever know. These people I put in a catogarory of IMPERSONATORS 4 self BELIFE. They write, print only what they want u 2 belive.It does not matter what POLITICAL party or goverment do 2 change,improve,make things better will never satisfy them. Their point of view will always b NEGATIVE. Mandalay has lost her soul to the Chinese and has become an extension of Yunan. It has become Sodom and Gomorrah; another Bangkok where our young men and women can be had just over a few a kyats’s (no pun intended). I put the blame squarely on the Burmese Military Government of lining their pockets and flushing the country down the drain – can Yangon be next? Please prevent Mandalay from becoming a Yunannese city. I don't care about what Kipling said about Mandalay. He was never there, but I used to live in Mandalay during the 1950's, when it was less Chinese! What SIMON ROUGHNEEN has written has nothing to provoke your immature response. Responses like these most commonly from the pro-governmental mouthpieces just show up your immaturity and upbringing. Didn't your mother teach you how to behave ? It's not too late to learn ! It is not U Bein bridge, moron! It is U Pein. Pein mean thin or skinny. Get it? You, alien journalists, write a lot of rubbish about Burma, knowing nothing about the Burmese language. Burmese letter 'pa' is often pronounced as if it is 'ba'. There is no Depayin. It is tabayin.It always has been Tabayin, about 9 miles south of Ye-U, in shwebo District. We know everything. Including your lies and distortions. Mandalay is a beautiful place, and it does not belong to China. Peaceful means should be negotiated for all Chinese who should not be there to leave. That applies especially to those dealing in illegal activities or trade.